Good People of America, Defend Terri Schiavo! This heartfelt plea for Terri's life coming from one who is disabled points up where we are going if Terri is killed. The T4 euthanasia program in Germany was begun, not by the Nazis, but by doctors and the courts. (Sound familiar?) The ground was hoed by a judge (Karl Binding) and a psychiatrist (Alfred Hoche) who published The Release of the Destruction of Life Devoid of Value in Leipzig in 1920. Its thesis: Some people are living lives with no value whatsoever and their killing should be seen in the same light as eliminating vermin. Consider this statement by the judge: "How wastefully we treat life that is precious and full of vigor and power and how much wasted manpower, patience, and capital investment is invested at the same time to keep life not worth living alive...creatures of no value at all, indeed who are quite an obstacle." Terri is certainly "an obstacle" to Michael and more than an obstacle, perhaps, if she can ever describe what happened the night she "collapsed." At the Nuremburg trial the evil philosophy of these two men was credited for undergirding the Nazi extermination program. The book, only 60 pages long, paved the way for the killing of the "unfit" to be accepted by the German public. Judge George Greer, the Karl Binding of our day, will hear another legal argument this afternoon. It is possible this will clear the way for removing Terri's feeding tube as soon as tomorrow. If Martin Luther King lived in Nazi Germany, do you think he would also have stood against their euthanasia program which killed thousands of defenseless mentally and physically disabled people? Of course he would. Martin Luther King stood for inclusion of all people within the embrace of the greater Human Community. He believed in the innate human dignity of every individual and their God-given right to pursue their best human potential regardless of life’s barriers and circumstances. My name is Mark Pickup and I am incurably ill with progressive multiple sclerosis (MS). It is my luxurious belief that if the Great Man were alive to day, he would be on a flight to Florida to stand outside the Clearwater Florida hospital where a disabled woman (Terri Schiavo) is about to be starved to death with court sanction. I can hear Dr. King calling for Terri’s unalienable Right to Life. He would stand in solidarity and comfort of Terri, her parents and siblings against anti-disability judicial tyranny. I must believe it—my future may be more disabled than Terri Schiavo’s present. Good people of America! Speak in the noble tradition of Martin Luther King for the unalienable right of people with disabilities to exist. Demand something better from government, the judiciary and medicine than killing the disabled. Good people of America, rise up en masse against the inhuman cruelty of the deliberate starvation killing of Terri Schiavo. Keep alive Martin Luther King’s noble legacy of non-violent demonstration for the equality of all people and unalienable universal human rights (the first of which is the Right to Life). Terri Schiavo symbolizes all disabled and handicapped people: Her court sanctioned starvation will send an ominous threat about the future for other disabled people, like me. How will 21st Century society treat us? Killing Terri because of her disability may be “legal” but it is wrong and violates great principles upon which America was founded. Give us life with dignity, not death. If possible, demonstrate outside the facility where Terri will be starved. Alternatively, write, email, fax: Governor Jeb Bush, Office of the Governor, The Capitol, Tallahassee, FL 32399-0001. Email jeb.bush@MyFlorida.com & Jeb@jeb.org), fax: 850.922.4292, Alternate 850.487.0801. 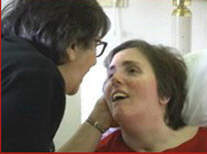 Write President Bush demanding an Executive Order banning the starvation of Terri Schiavo. president@whitehouse.gov, fax c/o Andy Card, White House Chief of Staff: 202.456.1907.